New Sun Rising provides strategic programs, vital services, and accessible funding to power civic innovation from idea to impact. Since 2005, hundreds of individuals, organizations, and funders have worked with New Sun Rising to launch nonprofit projects, social businesses, and economic development initiatives throughout the Pittsburgh region. We deliver the following programs to support fresh, creative solutions to social problems that are more effective, efficient, and/or sustainable than what currently exists. 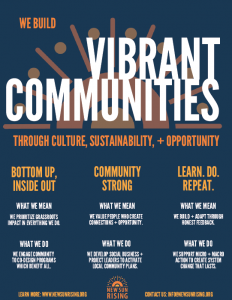 We build the capacity of organizations to create Culture, Sustainability, & Opportunity in their neighborhood. 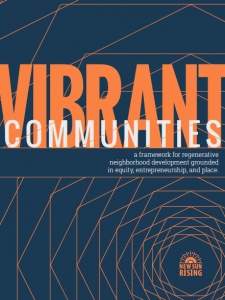 The programs in our Vibrant Communities framework help to catalyze regenerative neighborhood development grounded in equity, entrepreneurship, and place. Investments are led by the community voice to Ignite, Launch, and Grow social businesses, nonprofit projects, and collaborative initiatives. 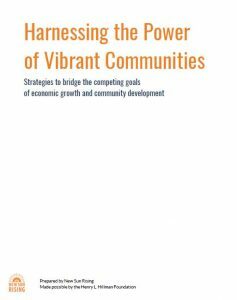 Implementation strategies include Planning, Connectivity, and Resources to promote an authentic civic Identity. We provides the legal structure and financial management to help nonprofit leaders succeed through Fiscal Sponsorship. Some of the leading social innovators in the region — including professional arts organizations, cooperative incubators, and multi-municipal sustainability planning efforts — operate with our support. Our consulting services help to Grow established social businesses, nonprofits, and community initiatives. 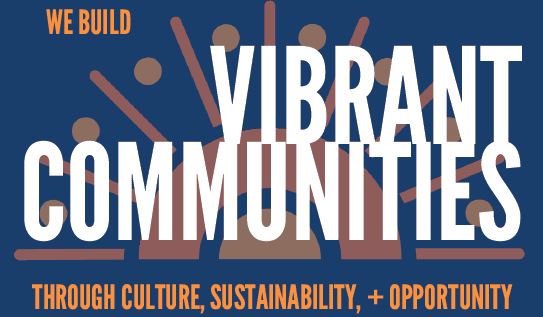 We create accessible funding for leaders building culture, sustainability, and/or opportunity in their community through our impact investment portfolio, the Vibrancy Funds. Cross-sector leaders are supported through grant, award, and loan programs. Our portfolio report underscores our commitment to transparency and we partner to manage the philanthropic efforts of individuals, organizations, and foundations in creative ways. Through the visionary leadership of New Sun Rising’s staff, board of directors, and network of partners, we continue to explore the possibilities of civic innovation and socioeconomic development built from the bottom up, and inside out.